The light changes for cross traffic on Matinal when no cars are present. Light programming changed 3 days ago and is a much less responsive cycle leaving cars waiting for long periods on Dwight. This light was a perfect example of good stoplight programming in the past but has changed. 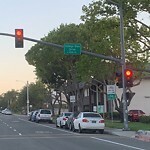 The turn signals on clairemont mesa Blvd at diane Avenue need their timing adjusted. The left turn facing west is really bad. Thank you. The timing of the light are off. The light that controls left lane, northward traffic is slow. Signal lights stay green for under 15 seconds, for traffic driving north on Ocean View Hills.